Complete kit contains everything required for making professional-quality repairs in just minutes. State-of-the-art components and easy-to-follow instructions with photographs. 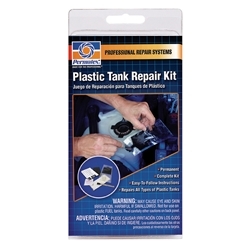 Repairs all types of plastic tanks. The repair resin is designed to harden within 8 – 10 minutes and cures in 30 minutes. Repairs can be made ideally at temperatures from 50°F to 75°F (10°C to 24°C). Repairs cracks up to 4 inches in length and holes up to 3/8 inch in diameter. Permanent. Suggested Applications: Ideal for cars, trucks, boats and RV’s; windshield washer reservoirs, radiator overflow tanks, coolant reservoirs, water tanks, waste tanks *Not for use on Plastic Fuel Tanks.